This is the 1942/43 edition. The side of the box lid states a copyright date of 1943, the inside of the box and the field state 1942. All the games issued between 1942 and 1944 contain the same player discs. The card set is overall in VERY GOOD-EXCELLENT condition. The game contains a complete set of 1942/43 edition player discs. These are all original, Cadaco-produced discs, not photocopies or home-made discs. Click HERE for a complete list of the players included with this set. I have inventoried and inspected the cards and every card has been accounted for. A few have light creases. There is some very faint fingerprint soiling visible on close inspection. No writing. No tears or bad creases. Overall a really nice set of discs. I would grade them 6-7 on a 10 scale (see condition guide below). The other game parts are in EXCELLENT condition. The game is 100% complete. 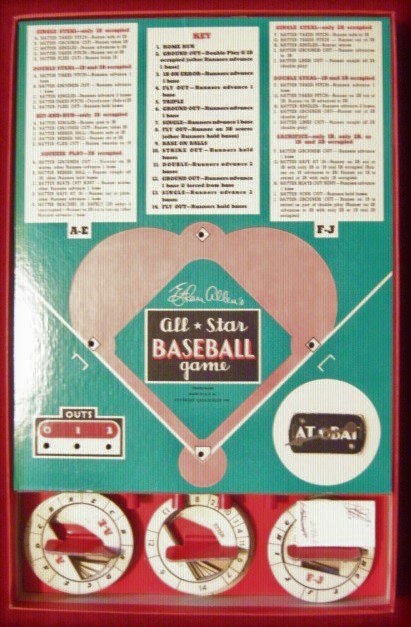 It includes all the components that originally came with this edition of the game. Very little play wear is evident. The scoresheets got left out of the photo but there are a couple included. These have already been filled out. Overall I would grade the game parts 8 on a 10 scale (see condition guide below). The game box is in GOOD-VERY GOOD condition. 3 of the 4 corners have split. There is some scraping along the edges. The previous owner affixed a small address sticker to the front of the lid. That said the box is still attractive and would display well. I would grade it 4-5 on a 10 scale (see condition guide below).